The Global Volcanism Program has no activity reports for Bliznetsy. The Global Volcanism Program has no Weekly Reports available for Bliznetsy. The Global Volcanism Program has no Bulletin Reports available for Bliznetsy. The Global Volcanism Program has no synonyms or subfeatures listed for Bliznetsy. The Bliznetsy ("Twins") lava flows occupy a low-lying area east of the Sredinny Range and north of the Eastern Volcanic Zone volcanoes. The young flows lie south of the Ozernaya River about 80 km north of historically active Sheveluch volcano. Effusion of about 0.5 km3 of lava flows about 3000 years ago was preceded by weak phreatomagmatic eruptions. Babansky A D, Pevzner M M, Volynets A O, 2006. Petrology, geochemistry and geodynamics of Holocene volcanism in the Elovka River basin (North Kamchatka). All Russian Symposium "Volcanism and Geodynamics" September, 2006, Ulan-Ude, Russia, abs . There is no Deformation History data available for Bliznetsy. There is no Emissions History data available for Bliznetsy. 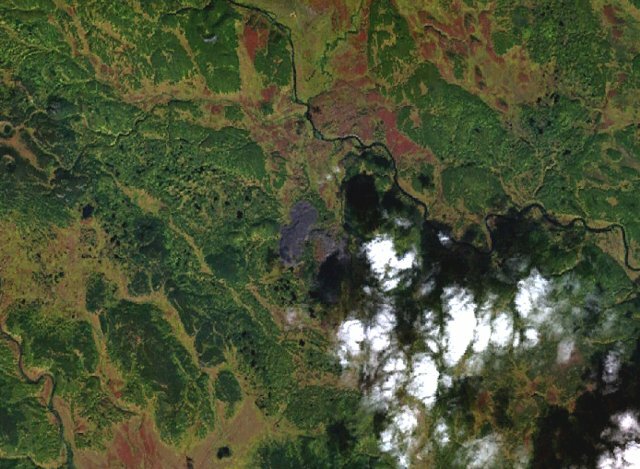 The grayish area to the left of the clouds near the center of the NASA Landsat image (with north to the top) is the Bliznetsy ("Twins") lava flows. These flows were erupted about 3000 years ago in a low-lying area east of the Sredinny Range and south of the Ozernaya River, which is visible cutting diagonally across the upper right part of the image. The unusual location of this recently studied young volcanic vent lies north of the margin of the subducting Pacific Plate. Two closely spaced vents visible near the center of this photo produced the Bliznetsy ("Twins") lava flows. Prominent flow levees are visible on the flows, which were dated at about 3000 years ago. Emplacement of the ca. 0.15 cu km lava field was preceded by weak phreatomagmatic eruptions. 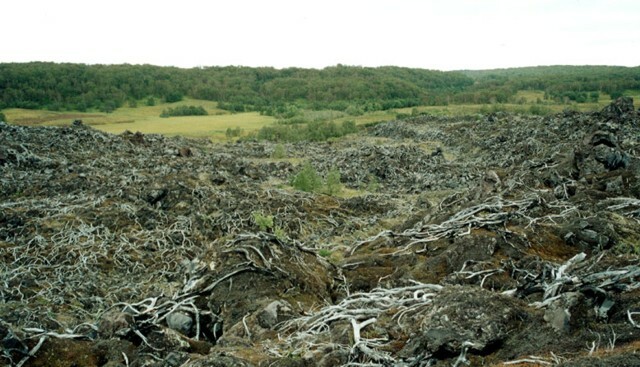 Photo courtesy of Maria Pevzner (Russian Academy of Sciences, Moscow). 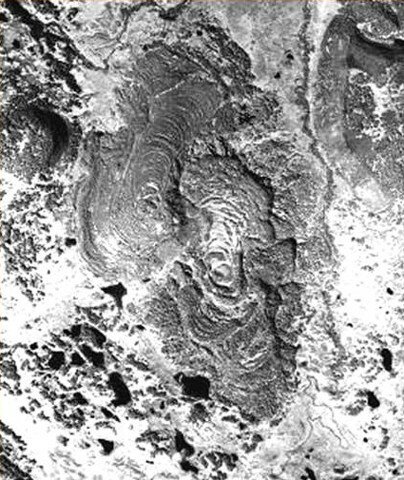 The rough-textured northwestern lava flow of the Bliznetsy group (The "Twins") advanced over flat-lying terrain. The flow was erupted about 3000 years ago. Copyrighted photo by Maria Pevzner (Holocene Kamchataka volcanoes; http://www.kscnet.ru/ivs/volcanoes/holocene/main/main.htm). There are no samples for Bliznetsy in the Smithsonian's NMNH Department of Mineral Sciences Rock and Ore collection. Large Eruptions of Bliznetsy Information about large Quaternary eruptions (VEI >= 4) is cataloged in the Large Magnitude Explosive Volcanic Eruptions (LaMEVE) database of the Volcano Global Risk Identification and Analysis Project (VOGRIPA).